Most likely this is the grips it came with. 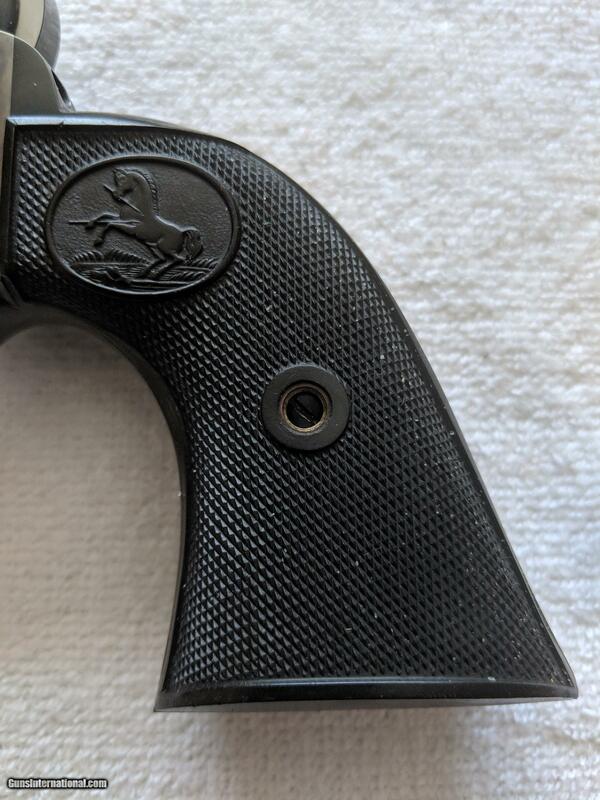 The hard rubber grips without the American eagle were used from 1956 to 1964.
a real colt a late model. I think I would check with colt about a refinish. if it posable. A complete refinish by COLT would cost about half the price of a new Revolver. Colt offered Wood Grips at this time in production. But they cost a couple of bucks more, and had gold medallions. Honestly I don't know that I would do ANYTHING to it! It has some character yes, but it looks authentic, and for a 60yr old gun? It looks great. Have you thought about getting a Colt letter? This weapon doesn't have character--it has attitude. If it were mine I would not spend money on refinishing, or grips, or a letter which will probably say it was shipped to Schmedlapps's Hardware Store, but would use it just as it was and delight in not have to dither about preserving its cosmetic appearance. A real working Colt; not a faked up finish on a new gun. Squeeze the old gal where you grip her and dance the night away as her dress is pretty enough as is. The prom queen is prissy and won't provide a Happy Ending. Caliber? How is the lettering on the top of the barrel? Yes, wood and I believe it was plain with no emblems was like a $5 option. Wood with nickel appears to be more common. Take them off and see if the serial number is written on the insides. Getting ready to load up some bullets for it and going to start real light just out of respect for the old gal. Probably some kind of trailboss load which will be a first time using it. Or possibly some old stand by unique. Dont know why I'd be worried about anything since it was made in 1958. I've got other handguns older that that but I dont shoot most of my guns with full bore loads. She looks good just as she is.